Please contact us to get your free estimate. We look forward to working with you on your project! We have worked with scores of customers from individual business people to small businesses to high volume providers of rulers and templates. We encourage you to review our frequently asked questions below and contact us for a free estimate for your project! Tell me more about the acrylic plastic that you use to cut. We use high-quality, cast acrylic plastic that is commonly referred to as "Plexiglass". Rulers and templates use 1/8-inch (3 mm) thick acrylic which is the same thickness as the rulers and templates quilters and sewers use with a rotary cutter to cut and mark their fabric. The most common colors, by far, that we use are clear and transparent fluorescent green (a yellow-green). Other colors are possible upon request. What information do you need to provide an estimate? Ideally, what we prefer is a "vectorized" computer-generated drawing. Popular vectorized file formats include ai, cdr, dxf and dwg. Pdf files may be vectorized; however, a pdf file created by scanning on a copier is not vectorized, but rather is a bitmap. Jpg and png files are also of a bitmap format. Bitmap files are not to scale. If a hardcopy drawing is provided, it is best to do so on graph paper; however, our accuracy is only as good as the drawing. If what is to be cut is a very simple shape, such as a square or circle, you can simply provide us the shape's dimensions. As mentioned above, the most common colors are clear and transparent fluorescent green, with clear being the less expensive of the two. Fluorescent green is a yellow-green and is best if there are markings that need to be clearly visible. How many of the ruler/template that you want. Will you custom engrave your CutRiteTM rulers and templates? Yes! Most popular are custom-engraving the seam guide followed by the HandiRuler and Mini-HandiRuler . They are perfect for branding your business and very reasonably priced. Turnaround time depends on the complexity and quantity of what is being made. However, typical turnaround time is 1-2 weeks from when you say "go". For higher volume jobs, it may be necessary for us to order more acrylic material which could require a little extra time. Have you cut acrylic for things other than templates and rulers? Yes! 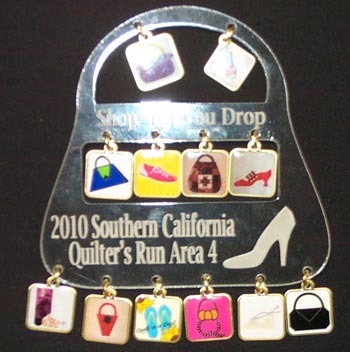 Examples incluce name tags, key chain fobs, purse and bag bottoms, and various quilting and sewing notions. Pictured to the right is a charm holder for a quilt run in which each shop in the run gave away a free charm. Do you provide screen printing capabilities? When silk screening, the acrylic pieces are first cut and then silk screened by a separate machine. This requires that the silk screening process be very exact when lining up the machinery with the piece to be printed so the markings and letters are printed precisely where they need to be. Based on input from some of our customers, while this works most of the time, errors do occur. When doing engraving, the engraving and cutting are all done by the same machine based on the same digital drawing so no errors occur. Silk screen markings can wear off over time; engraved markings do not.